Although the pathogenesis of systemic sclerosis (SSc) still remains unknown, recent studies have demonstrated that endothelins are deeply involved in the developmental process of fibrosis and vasculopathy associated with SSc, and a dual endothelin receptor antagonist, bosentan, has a potential to serve as a disease modifying drug for this disorder. Importantly, endothelin-1 (ET-1) exerts a pro-fibrotic effect on normal dermal fibroblasts and bosentan reverses the pro-fibrotic phenotype of SSc dermal fibroblasts. The purpose of this study was to clarify the details of molecular mechanisms underlying the effects of ET-1 and bosentan on dermal fibroblasts, which have not been well studied. The mRNA levels of target genes and the expression and phosphorylation levels of target proteins were determined by reverse transcription real-time PCR and immunoblotting, respectively. Promoter assays were performed using a sequential deletion of human α2 (I) collagen (COL1A2) promoter. DNA affinity precipitation and chromatin immunoprecipitation were employed to evaluate the DNA binding ability of Fli1. Fli1 protein levels in murine skin were evaluated by immunostaining. In normal fibroblasts, ET-1 activated c-Abl and protein kinase C (PKC)-δ and induced Fli1 phosphorylation at threonine 312, leading to the decreased DNA binding of Fli1, a potent repressor of the COL1A2 gene, and the increase in type I collagen expression. 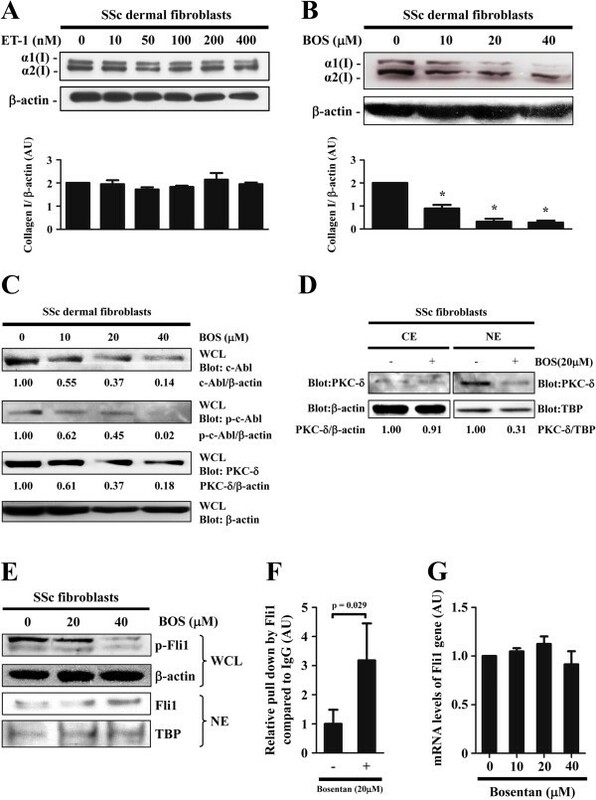 On the other hand, bosentan reduced the expression of c-Abl and PKC-δ, the nuclear localization of PKC-δ, and Fli1 phosphorylation, resulting in the increased DNA binding of Fli1 and the suppression of type I collagen expression in SSc fibroblasts. In bleomycin-treated mice, bosentan prevented dermal fibrosis and increased Fli1 expression in lesional dermal fibroblasts. 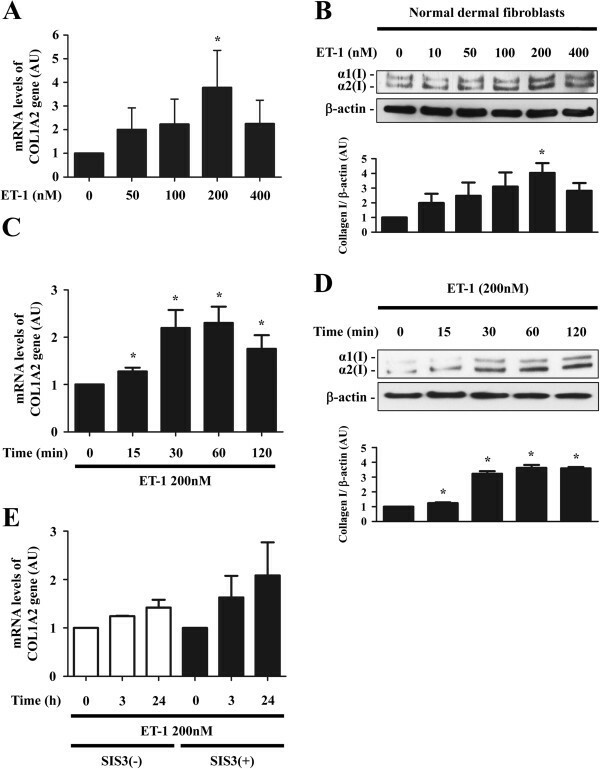 ET-1 exerts a potent pro-fibrotic effect on normal fibroblasts by activating “c-Abl - PKC-δ - Fli1” pathway. Bosentan reverses the pro-fibrotic phenotype of SSc fibroblasts and prevents the development of dermal fibrosis in bleomycin-treated mice by blocking this signaling pathway. Although the efficacy of bosentan for dermal and pulmonary fibrosis is limited in SSc, the present observation definitely provides us with a useful clue to further explore the potential of the upcoming new dual endothelin receptor antagonists as disease modifying drugs for SSc. Systemic sclerosis (SSc) is a multisystem connective tissue disease characterized by immune abnormalities, vascular injuries, and fibrosis of skin and certain internal organs . Although the pathogenesis of SSc still remains unclear, it has been believed that fibroblast activation is a final consequence following inflammation, autoimmune attacks, and vascular damage. A wealth of evidence suggests that, once activated, SSc dermal fibroblasts establish a self-activation system by autocrine transforming growth factor (TGF)-β stimulation at least partially via upregulating cell surface receptors for latent-form TGF-β, such as integrin αVβ3, integrin αVβ5, and thrombospondin-1 [2–6]. A plausible strategy to treat fibrosis in SSc is to block the autocrine TGF-β signaling in SSc fibroblasts and better understanding of its molecular mechanism is necessary to develop the treatment for this complicated disorder [1, 7]. The endothelins are a family of 21-amino-acid peptides mainly produced by endothelial cells, which consist of three isoforms, including endothelin-1 (ET-1) and the related peptides endothelin-2 and -3. In addition to a potent vasoconstrictive effect, ET-1 possesses a wide range of biological effects on different cell types. Several lines of evidence have demonstrated that ET-1 plays a pivotal role in the process of fibroblast activation as a downstream target of TGF-β [8–11]. TGF-β1 induces the expression of ET-1 through Smad- and activator protein-1/c-Jun N-terminal kinase-dependent signaling in human dermal fibroblasts, while through a Smad-independent ALK5/activator protein-1/c-Jun N-terminal kinase-dependent signaling in human lung fibroblasts, and the ability of TGF-β1 to trigger the pro-fibrotic gene program is dependent on ET-1 in both of these cells [9, 12]. In animal models, forced expression of ET-1 accelerates dermal wound healing as well as TGF-β1, while blockade of endothelin signaling with bosentan, a dual endothelin receptor antagonist, significantly inhibits the effect of TGF-β1 on dermal wound healing . Importantly, bosentan also attenuates bleomycin (BLM)-induced skin fibrosis in animal models . Thus, endothelins are potentially implicated in the pathogenesis of fibrotic disorders. The role of ET-1 has also been well-studied in SSc. Circulating ET-1 levels are elevated in diffuse cutaneous SSc and limited cutaneous SSc patients compared with healthy controls, and in limited cutaneous SSc patients with pulmonary arterial hypertension as compared to those without [13, 14], suggesting the involvement of ET-1 in the development of fibrotic and vascular involvement associated with SSc. Clinically, bosentan has been shown to prevent the development of new digital ulcers in SSc patients by two high-quality randomized clinical trials [15, 16]. As for pulmonary arterial hypertension associated with SSc, bosentan mostly prevents the exacerbation of hemodynamic parameters and improves exercise tolerance evaluated by 6-minute walk distance [17–19]. These clinical data suggest that bosentan is useful for the treatment of vascular involvement in SSc. In contrast, the clinical efficacy of bosentan for interstitial lung disease (ILD) is relatively limited [20, 21], though bosentan reverses the pro-fibrotic phenotype of cultured SSc lung fibroblasts [8–11]. Since this discrepancy between experimental data and clinical observation may be partly due to the relatively lower tissue distribution of bosentan (approximately 1%) , endothelin receptor antagonists with better tissue distribution have a potential to improve the pathological fibrosis in SSc. As described above, although ET-1 is a potent pro-fibrotic peptide and bosentan exerts a novel anti-fibrotic effect, the detailed molecular mechanism explaining these observations has still remained unknown. Therefore, we herein investigated the mechanisms by which ET-1 drives a pro-fibrotic gene program in normal dermal fibroblasts and bosentan reverses the pro-fibrotic phenotype of SSc dermal fibroblasts and the experimental dermal fibrosis in animal models. Anti-Fli1 antibody for immunoblotting and immunofluorescence and anti-protein kinase C (PKC)-δ antibody were purchased from Santa Cruz Biotechnology (Santa Cruz, CA, USA). Anti-Fli1 antibody for immunohistochemistry was obtained from BD Biosciences (San Diego, CA, USA). Antibodies against c-Abl and phospho-c-Abl (Tyr245) were bought from Cell Signaling (Danvers, MA, USA). Antibodies for β-actin and α-smooth muscle actin (α-SMA) and antibody for type I collagen were products from Sigma-Aldrich (St. Louis, MO) and Southern Biotech (Birmingham, AL, USA), respectively. The polyclonal rabbit anti-phospho-Fli1 (Thr312)-specific antibody was generated as described previously . Bosentan was a gift from Actelion Pharmaceuticals (Allschwil, Switzerland). Smad3 inhibitor SIS3 was purchased from Calbiochem (San Diego, CA, USA). Human dermal fibroblasts were obtained by skin biopsy from the affected areas (dorsal forearm) of eight patients with diffuse cutaneous SSc with less than 2 years of skin thickening and from the corresponding area of eight closely matched healthy donors. Fibroblasts were cultured in Dulbecco’s modified eagle medium with 10% fetal calf serum, 2 mM L-glutamine, and the antibiotic antimycotic solution. These cells were individually maintained as monolayers at 37°C in 95% air, 5% CO2. All studies used cells from passage number three to six. The study was performed according to the Declaration of Helsinki and approved by the ethical committee of the University of Tokyo Graduate School of Medicine. Written informed consent was obtained from all of the patients and healthy controls. Cell viability was evaluated by the trypan blue exclusion test. Cells were treated with the indicated concentration of bosentan. Cell viability was examined at 24 and 48 hours. Stained (dead) and unstained (viable) cells were counted with a hematocytometer. Confluent quiescent fibroblasts were serum-starved for 48 hours and harvested. In some experiments, cells were stimulated with ET-1 or bosentan for the indicated period of time before being harvested. Whole cell lysates and nuclear extracts were prepared as described previously [2, 24]. Samples were subjected to sodium dodecyl sulfate-polyacrylamide gels electrophoresis and immunoblotting with the indicated primary antibodies. Bands were detected using enhanced chemiluminescent techniques (Thermo Scientific, Rockford, IL, USA). According to a series of pilot experiments, anti-Fli1 antibody and anti-phospho-Fli1 (Thr312)-specific antibody work much better in immunoblotting using nuclear extracts and whole cell lysates, respectively. Total RNA was isolated from normal and SSc fibroblasts with RNeasy spin columns (Qiagen, Crawley, UK). One μg of total RNA from each sample was reverse-transcribed into cDNA using the iScript cDNA synthesis kit (Bio-Rad, Hercules, CA, USA). Real-time quantitative PCR was performed using Fast SYBR Green PCR Master Mix (Applied Biosystems, Carlsbad, CA, USA) on ABI prism 7000 (Applied Biosystems) in triplicates. Human α2 (I) collagen (COL1A2) and Fli1 mRNA levels were normalized to human 18S rRNA mRNA levels. The sequences of primers for COL1A2, Fli1, and 18S rRNA were obtained from previous publications [25, 26]. The ΔΔCt method was used to compare target gene and housekeeping gene (18S rRNA) mRNA expression. Generation of a series of 5′-deletions of COL1A2/chloramphenicol acetyltransferase (CAT) construct consisting of the COL1A2 gene fragments (+58 to −353, −264, −186, or −108 bp relative to the transcription start site) linked to the CAT reporter gene was done as previously described [27, 28]. Normal or SSc fibroblasts were grown to 50% confluence in 100-mm dishes, transfected with the indicated constructs along with pSV-β-galactosidase (β-GAL) using FuGENE6 (Roche Diagnostics, Indianapolis, IN, USA). After overnight incubation at 37°C, some cells were further stimulated with ET-1 or bosentan for 24 hours. The cells were harvested and CAT and β-GAL mRNA levels were determined using RT real-time PCR. Transfection efficiency was normalized by β-GAL mRNA levels. In some samples, it was confirmed that this method reproduces the results of relative promoter activity evaluated by the canonical method of CAT reporter assay using [14C]-chloramphenicol. The sequences of primers were as follows: CAT forward 5′-TTCGTCTCAGCCAATCCCTGGGTGA-3′ and reverse 5′-CCCATCGTGAAAACGGGGGCGAA-3′; β-GAL forward 5′-TCCACCTTCCCTGCGTTA-3′ and reverse 5′-AGAAGTCGGGAGGTTGCTG-3′. DNA affinity precipitation assay was performed as described previously . Briefly, nuclear extracts prepared from dermal fibroblasts were incubated for 10 minutes at 4°C with gel shift binding buffer, and 20 μg of poly (dI-dC) in a final volume of 1 ml. Pre-clearing was performed by adding streptavidin-coupled agarose beads and incubating the mixture for 30 minutes at 4°C. After centrifugation, the supernatant was incubated with 500 pM of COL1A2-EBS oligonucleotide, which corresponds to bp −307 to −269 of COL1A2 promoter, or COL1A2-EBS-M oligonucleotide, which has a mutated Ets binding site (EBS) of COL1A2-EBS oligonucleotide, overnight at 4°C. Then, streptavidin-coated agarose beads were added, followed by a further 2-hour incubation at 4°C. The protein-DNA-streptavidin-agarose complex was washed twice with Tris-ethylenediaminetetraacetic acid (EDTA) including 100 mM NaCl, twice with gel shift binding buffer, and once with PBS. Precipitates were subjected to immunoblotting with anti-Fli1 antibody. ChIP assay was carried out using EpiQuik ChIP kit (Epigentek, Farmingdale, NY, USA). Briefly, cells were treated with 1% formaldehyde for 10 minutes. The cross-linked chromatin was then prepared and sonicated to an average size of 300 to 500 bp. The DNA fragments were immunoprecipitated with anti-Fli1 antibody at 4°C. As a negative control, normal rabbit IgG was used. After reversal of crosslinking, the immunoprecipitated chromatin was quantified by RT real-time PCR. The primers were as follows: COL1A2/F-404, 5′-CTGGACAGCTCCTGCTTTGAT-3′; COL1A2/R-233, 5′-CTTTCAAGGGGAAACTCTGACTC-3′. BLM (Nippon Kayaku, Tokyo, Japan) or PBS was injected subcutaneously into the back of C57BL/6 mice daily for 3 weeks, as described previously . Immunohistochemistry with Vectastain ABC kit (Vector Laboratories, Burlingame, CA, USA) was performed on formalin-fixed, paraffin-embedded tissue sections using anti-Fli1 antibody according to the manufacturer’s instruction. Rabbit anti-Fli1 antibody and mouse anti-α-SMA antibody were used as primary antibodies and Alexa Fluor 546 goat anti-rabbit IgG antibody (Invitrogen, Carlsbad, CA, USA) and fluorescein isothiocyanate (FITC)-conjugated rat anti-mouse IgG antibody (Roche) were used as secondary antibodies. Coverslips were mounted by using Vectashield with DAPI (Vector Laboratories), and staining was examined by using Bio Zero BZ-8000 (Keyence, Osaka, Japan) at 495 nm (green), 565 nm (red), and 400 nm (blue). Statistical analysis was carried out with the Mann-Whitney U-test to compare the distributions of two unmatched groups. The paired t-test was used for the comparison of paired data after confirming the normal distribution. Statistical significance was defined as a P-value of <0.05. As an initial experiment, to determine the optimal dose of ET-1 to induce the expression of type I collagen in normal dermal fibroblasts, cells were treated with ET-1 at the concentration of 0, 50, 100, 200, or 400 nM for 24 hours and mRNA levels of the COL1A2 gene were determined by RT real-time PCR. As shown in Figure 1A, ET-1 significantly increased the mRNA levels of the COL1A2 gene at the concentration of 200 nM. To further confirm this finding at protein levels, the levels of type I collagen protein were determined by immunoblotting under the same conditions. As shown in Figure 1B, ET-1 induced the expression of type I collagen protein in a dose-dependent manner, reaching a peak at the concentration of 200 nM. Therefore, in the following studies, we stimulated cells with ET-1 at the concentration of 200 nM. Endothelin-1 (ET-1) induced the expression of type I collage through the non-Smad pathway in normal dermal fibroblasts. A, B. Quiescent normal dermal fibroblasts were treated with the indicated concentration of ET-1 for 24 hours. mRNA levels of the human α2 (I) collagen (COL1A2) gene were determined by reverse transcription (RT) real-time PCR ( A ). Under the same condition, whole cell lysates were subjected to immunoblotting with anti-type I collagen antibody ( B ). (C, D) Quiescent normal dermal fibroblasts were treated with 200 nM of ET-1 for the indicated period of time. mRNA levels of the COL1A2 gene (C) and the protein levels of type I collagen in whole cell lysates (D) were evaluated by RT real-time PCR and immunoblotting, respectively. (E) Quiescent normal dermal fibroblasts were treated with SIS3 (3 μM) or methanol. One hour later, some of the cells were treated with 200 nM of ET-1 for 3 or 24 hours. mRNA levels of the COL1A2 gene were assessed by RT real-time PCR. The graph represents fold change in mRNA levels of the COL1A2 gene and protein levels of type I collagen, which were quantified by densitometry, in response to ET-1 in comparison to unstimulated controls, which were arbitrarily set at 1. *P <0.05 versus control cells untreated with ET-1. α1(I), α1(I) procollagen; α2(I), α2(I) procollagen; AU, arbitrary unit. We next investigated the time course of ET-1-dependent induction of type I collagen in normal dermal fibroblasts. As shown in Figure 1C, the increase in the mRNA levels of the COL1A2 gene was observed modestly but significantly as early as 15 minutes and reached a maximum around 30 to 60 minutes after the ET-1 stimulation. This observation was also reproduced at protein levels by immunoblotting (Figure 1D). As Smad3 has a big impact on the TGF-β-dependent regulation of type I collagen expression, we also investigated the effect of Smad3 inhibitor SIS3 on the ET-1-induced mRNA expression of the COL1A2 gene. As shown in Figure 1E, SIS3 did not affect the mRNA levels of the COL1A2 gene induced by ET-1 stimulation. Collectively, these results indicate that ET-1 rapidly increases the expression of type I collagen via the non-Smad signaling pathway. To identify potential regulatory elements of the COL1A2 gene by ET-1, we performed a reporter analysis using a series of 5′-deletions of the COL1A2/CAT construct. As basal promoter activities of these constructs have been well-studied in our previous reports , we focused on the difference in the fold increase of each promoter activity induced by ET-1 stimulation. As shown in Figure 2, ET-1 significantly increased the promoter activity of the −353 COL1A2/CAT construct, whereas ET-1 totally lost its stimulatory effect on the promoter activity of the −264, −186, and −108 COL1A2/CAT constructs. These results indicate that the responsive element of COL1A2 promoter to ET-1 is located between −353 and −264 bp. 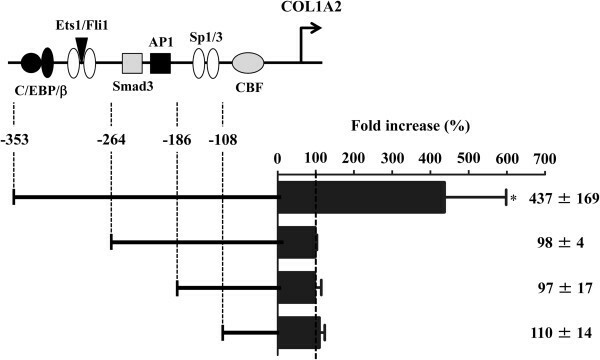 Given that ET-1 increases the mRNA expression of the COL1A2 gene independently of Smad3, ET-1 potentially exerts its stimulatory effect on the COL1A2 gene by inactivating transcriptional repressor(s). As the binding site of Fli1, a potent repressor of the COL1A2 gene, is located at −285 to −282 bp , we speculated that Fli1 may play a central role in the ET-1-dependent regulation of the COL1A2 gene expression. Identification of the responsive element to endothelin-1 (ET-1) stimulation in the human α2 (I) collagen (COL1A2) promoter. Normal dermal fibroblasts were transfected with 2 μg of the indicated 5′-deletion of the COL1A2/CAT construct and incubated for 48 hours. In some experiments, cells were treated with ET-1 (200 nM) for the last 24 hours. Values represent CAT mRNA levels relative to those of untreated cells transfected with the same COL1A2/CAT construct (100). The mean and SD from five separate experiments are shown. *P <0.05 versus control cells untreated with ET-1. To confirm the hypothesis described above, we asked if ET-1 regulates the transcriptional activity of Fli1 in normal dermal fibroblasts. Our previous studies reported that transcriptional activity of Fli1 is tightly regulated by the phosphorylation-acetylation cascade triggered by PKC-δ-dependent phosphorylation of Fli1 at threonine 312 . Phosphorylated Fli1 is subsequently acetylated by p300/CBP-associated factor at lysine 380, resulting in the loss of DNA binding ability  and degradation through the proteasomal pathway (unpublished data). As the phosphorylation of Fli1 at threonine 312 is a critical step regulating Fli1 transcriptional activity, we initially looked at the effect of ET-1 on the phosphorylation levels of Fli1 at threonine 312. As shown in Figure 3A, consistent with our hypothesis, Fli1 was phosphorylated at threonine 312 by ET-1 as early as 15 minutes after the stimulation. To further confirm if ET-1 decreases the binding ability of Fli1 to COL1A2 promoter, we employed the DNA affinity precipitation assay. As shown in Figure 3B, ET-1 stimulation decreased the DNA binding ability of Fli1 as early as 15 minutes, consistent with the results of immunoblotting. This observation was also confirmed in vivo by ChIP analysis showing that ET-1 decreased the association of Fli1 with the COL1A2 promoter at 3 hours after stimulation (Figure 3C). Taken together, these results indicate that ET-1 increases the promoter activity of the COL1A2 gene by attenuating the DNA binding of Fli1 through its phosphorylation at threonine 312. Endothelin-1 (ET-1) decreased the binding of Fli1 to the human α2 (I) collagen (COL1A2) promoter via increasing its phosphorylation at threonine 312. ( A ) Normal dermal fibroblasts were treated with ET-1 for the indicated period of time. Whole cell lysates were subjected to immunoblotting with anti-p-Fli1 antibody. To determine the total Fli1 levels, nuclear extracts were used for immunoblotting with anti-Fli1 antibody. ( B ) Nuclear extracts were incubated with biotin-labeled oligonucleotides. Proteins bound to these nucleotides were isolated with streptavidin-agarose beads, and Fli1 was detected by immunoblotting. Total Fli1 protein levels were determined by immunoblotting using the same nuclear extracts. ( C ) Chromatin was isolated from normal dermal fibroblasts and immunoprecipitated using rabbit anti-Fli1 antibody or rabbit IgG. After isolation of bound DNA, PCR amplification was carried out using COL1A2 promoter-specific primers. Input DNA was taken from each sample before addition of an antibody. The cycle threshold (Ct) values from IgG and Fli1 pull-down were subtracted by the number obtained from 10 × diluted input DNA. The relative pull-down of Fli1 was then normalized by the subtracted Ct value of IgG. The mean value of normal dermal fibroblasts without ET-1 stimulation was arbitrarily set at 1. All bands show one representative of three independent experiments. DNAP, DNA affinity precipitation; AU, arbitrary unit. We previously disclosed that sequential activation of c-Abl and PKC-δ is necessary for Fli1 phosphorylation at threonine 312 in response to TGF-β stimulation . Therefore, we next examined if ET-1 stimulation sequentially activates c-Abl and PKC-δ in normal dermal fibroblasts. As TGF-β1 increases the expression levels of c-Abl and PKC-δ in normal dermal fibroblasts [34, 35], we looked at the effect of ET-1 on the expression levels of c-Abl and PKC-δ by immunoblotting. As shown in Figure 4A, the expression levels of c-Abl and PKC-δ were markedly increased as early as 15 minutes after the ET-1 stimulation in normal dermal fibroblasts. Given that the phosphorylation levels of c-Abl reflect its activation status and nuclear localization is required for PKC-δ to directly phosphorylate Fli1, we also evaluated the phosphorylation levels of c-Abl and nuclear localization of PKC-δ under the same condition. 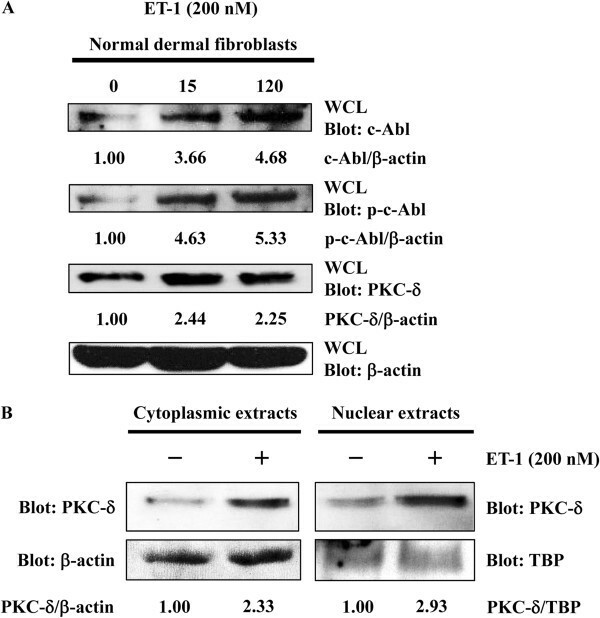 Consistently, ET-1 increased the phosphorylation levels of c-Abl (Figure 4A) and promoted the nuclear translocation of PKC-δ (Figure 4B) in normal dermal fibroblasts. Collectively, these results indicate that ET-1 stimulation activates the c-Abl/PKC-δ/Fli1 pathway and induces the expression of the COL1A2 gene. Endothelin-1 (ET-1) promoted the nuclear localization of protein kinase C ( PKC)-δ by activating c-Abl. ( A ) Normal dermal fibroblasts were treated with 200 nM of ET-1 for the indicated period of time. The protein levels of c-Abl, PKC-δ, and β-actin and the phosphorylation levels of c-Abl were determined by immunoblotting using whole cell lysates (WCL). ( B ) Normal dermal fibroblasts were treated with ET-1 for 30 minutes and cytoplasmic and nuclear extracts were prepared. The protein levels of PKC-δ in the cytoplasm and nucleus were determined by immunoblotting. Equal amounts of loading were confirmed by immunoblotting for β-actin in cytoplasmic extracts and for TATA binding protein (TBP) in nuclear extracts. The values below each blot represent the relative levels of target molecules normalized by loading controls with densitometry. Previous reports demonstrated that bosentan, a dual ET receptor antagonist, reverses a pro-fibrotic phenotype of SSc fibroblasts . However, the detailed mechanism by which bosentan exerts its prominent anti-fibrotic effect on SSc fibroblasts has still remained unknown. We previously demonstrated that Fli1 deficiency contributes to the establishment of the pro-fibrotic phenotype in SSc fibroblasts and imatinib mesylate, which targets the c-Abl/PKC-δ/Fli1 pathway, reverses the pro-fibrotic phenotype of these cells [33, 36]. Given that SSc fibroblasts are constitutively activated by autocrine stimulation of transforming growth factor- β (TGF-β), a potent inducer of ET-1, and produces an excessive amount of ET-1 [4, 9, 31, 37, 38], autocrine ET-1 appears to be involved in the self-activation system in SSc fibroblasts. 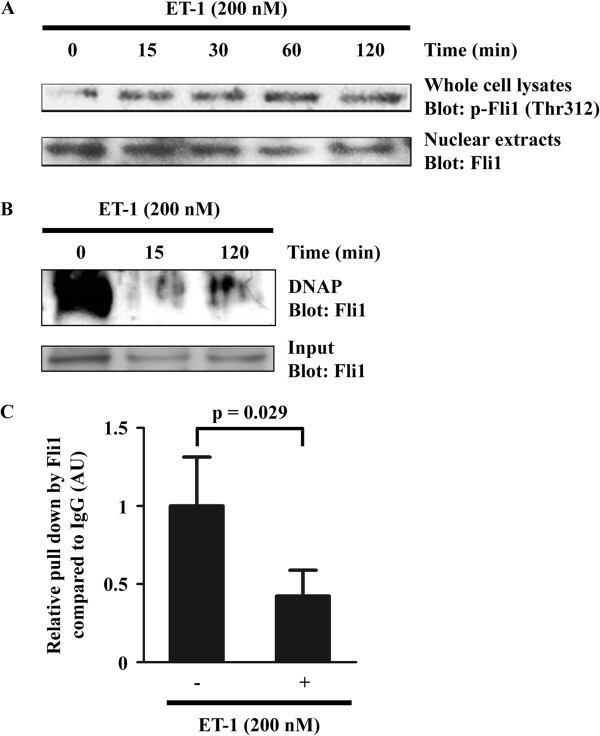 The present observation that ET-1 inactivates the transcriptional activity of Fli1 suggests that the blockade of autocrine ET-1 by bosentan reverses the pro-fibrotic phenotype of SSc fibroblasts by reactivating the transcriptional repressor activity of Fli1. To address this issue, we performed a series of experiments using cultured SSc dermal fibroblasts. Supporting the contribution of autocrine ET-1 to the activation of SSc dermal fibroblasts, exogenous ET-1 did not affect type I collagen expression (Figure 5A), whereas bosentan suppressed the expression of type I collagen in a dose-dependent manner without any effect on cell viability in SSc dermal fibroblasts (Figure 5B and Table 1). Furthermore, the total levels and the phosphorylation levels of c-Abl and the total levels and nuclear localization of PKC-δ were decreased in SSc dermal fibroblasts treated with bosentan (Figure 5C and 5D). Consistently, Fli1 phosphorylation at threonine 312 was reduced (Figure 5E) and the occupancy of Fli1 on COL1A2 promoter was increased in SSc dermal fibroblasts treated with bosentan (Figure 5F). Importantly, bosentan did not affect the mRNA levels of the FLI1 gene in SSc dermal fibroblasts (Figure 5G). Collectively, these results indicate that autocrine ET-1 contributes to the activation of SSc dermal fibroblasts and bosentan reverses a pro-fibrotic phenotype of SSc dermal fibroblasts by increasing the DNA binding ability of Fli1. 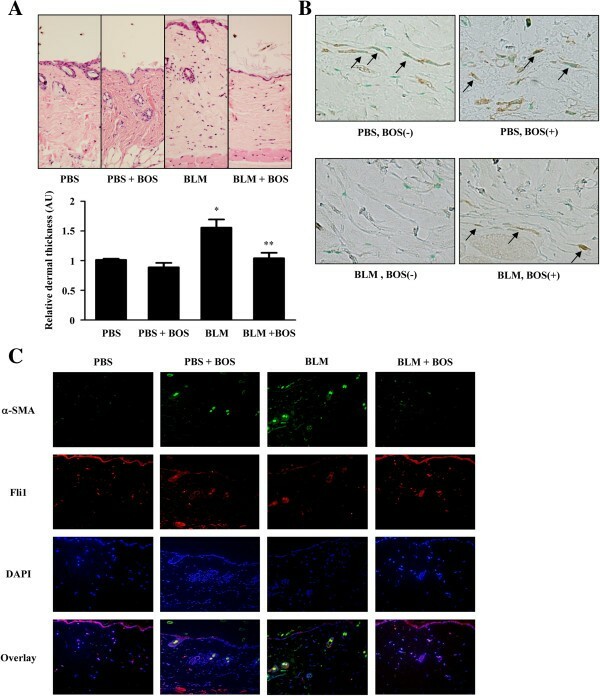 Bosentan reversed the pro-fibrotic phenotype of systemic sclerosis (SSc) dermal fibroblasts via increasing the DNA binding of Fli1. ( A-C ) Whole cell lysates (WCL) prepared from SSc fibroblasts treated with endothelin-1 (ET-1) for 24 hours (A) or bosentan (BOS) for 48 hours (B, C) were subjected to immunoblotting ( D ) Protein kinase C (PKC)-δ levels were examined by immunoblotting in cytoplasmic extracts (CE) and nuclear extracts (NE) prepared from SSc fibroblasts treated or untreated with bosentan for 48 hours. ( E-G ) SSc fibroblasts were treated or untreated with bosentan for 48 hours. Fli1 phosphorylation levels and total Fli1 levels were determined by immunoblotting (E). Fli1 occupancy of the human α2 (I) collagen (COL1A2) promoter was determined by chromatin immunoprecipitation and reverse transcription (RT) real-time PCR (F). Fli1 mRNA levels were determined by RT real-time PCR (G). The graph represents fold change in type I collagen protein levels quantified by densitometry (A, B), Fli1 occupancy of the COL1A2 promoter (F), and Fli1 mRNA levels (G) in comparison to unstimulated controls, which were arbitrarily set at 1. Equal amounts of loading were confirmed by immunoblotting for β-actin in cytoplasmic extracts and for TATA binding protein (TBP) in nuclear extracts. The values below each blot represent the relative levels of target molecules normalized by loading controls with densitometry. α1(I), α1(I) procollagen; α2(I), α2(I) procollagen; AU, arbitrary unit. The impact of bosentan on cell viability was evaluated by trypan blue exclusion test. The percentage of cell viability was calculated according to the following formula: % cell viability = (viable cell count/total cell count) × 100. Data are expressed as the mean ± SD of results in three independent experiments. Finally, we investigated if bosentan increases the expression of Fli1 protein in lesional dermal fibroblasts of the BLM-induced SSc murine model because previous reports demonstrated that bosentan prevents the development of dermal fibrosis in this model . As we could reproduce the preventive effect of bosentan on dermal fibrosis in BLM-treated mice (Figure 6A), we carried out immunostaining for Fli1 in the skin samples taken from these mice. As shown in Figure 6B, in the absence of bosentan, the number of Fli1-positive dermal fibroblasts was much more decreased in dermal fibroblasts of BLM-treated mice than in those of PBS-treated mice. In contrast, when administered bosentan, the number of Fli1-positive dermal fibroblasts was comparable between BLM-treated mice and PBS-treated mice. Importantly, the signals of Fli1 and α-SMA, a marker of myofibroblasts, in double immunofluorescence were mutually exclusive in most of dermal fibroblasts (Figure 6C), indicating that Fli1 expression is closely related to the inactivation of dermal fibroblasts in vivo. Collectively, these results suggest that bosentan prevents the development of dermal fibrosis in the BLM-induced SSc murine model, at least partially, by increasing the expression of Fli1 protein in lesional dermal fibroblasts. Bosentan prevented the development of dermal fibrosis, at least partially, by increasing the expression of Fli1 protein in lesional dermal fibroblasts of bleomycin (BLM)-induced systemic sclerosis (SSc) murine model. Wild-type C57BL/6 mice were injected with BLM (200 μg) or PBS into the skin of the back for 3 weeks. In some mice, bosentan (BOS) was administered intraperitoneally for 4 weeks from 1 week before BLM treatment. (A) The thickness of the skin on the back was evaluated by hematoxylin and eosin staining. The graph represents fold change in the dermal thickness in comparison to PBS-treated mice without bosentan administration, which was arbitrarily set at 1. ( B ) The expression levels of Fli1 protein were determined by immunohistochemistry. The arrows represent Fli1-positive dermal fibroblasts. ( C ) Double immunofluorescence for Fli1 (red) and α-SMA (green). Blue signals of nuclei were detected with 4′,6-diamidino-2-phenylindole (DAPI). The bottom panels represent the overlay of the three above. *P <0.05 versus PBS-treated mice without bosentan. **P <0.05 versus BLM-treated mice without bosentan. AU, arbitrary unit. This study was undertaken to clarify the molecular mechanism underlying the pro-fibrotic effect of ET-1 on normal dermal fibroblasts and anti-fibrotic effect of bosentan on SSc dermal fibroblasts. A series of experiments demonstrated that ET-1 activates the c-Abl/PKC-δ/Fli1 pathway and reduces the DNA binding ability of Fli1, resulting in the induction of type I collagen expression. Given that a pro-fibrotic phenotype of SSc fibroblasts is largely due to stimulation by autocrine TGF-β, a potent inducer of ET-1, and those cells produce a much larger amount of ET-1 than normal dermal fibroblasts [1, 7, 38], it was speculated that the blockade of ET-1-dependent signaling by bosentan reverses the pro-fibrotic phenotype of SSc dermal fibroblasts by increasing the DNA binding of Fli1 through the inhibition of the c-Abl /PKC-δ/Fli1 pathway, which is constitutively activated in those cells . Supporting this hypothesis, exogenous ET-1 did not affect type I collagen expression, whereas bosentan suppressed the expression of c-Abl and PKC-δ, decreased the nuclear localization of PKC-δ and Fli1 phosphorylation at threonine 312, and eventually increased the DNA binding ability of Fli1 to the COL1A2 promoter resulting in the reduction of type I collagen expression in SSc dermal fibroblasts. Furthermore, bosentan increased the expression levels of Fli1 protein in lesional dermal fibroblasts of BLM-treated mice. As the protein stability of Fli1 increases when Fli1 binds to DNA, and is protected from degradation, these in vivo data suggest that bosentan prevents the development of dermal fibrosis in BLM-treated mice by increasing the DNA binding of Fli1 in lesional dermal fibroblasts. Collectively, these results indicate that the anti-fibrotic effect of bosentan on SSc dermal fibroblasts and BLM-induced SSc murine model is at least partly attributable to the increase in the DNA binding ability of Fli1. ET-1 induces a pro-fibrotic phenotype in fibroblasts through increasing the expression of extracellular matrix (ECM) proteins, such as type I and III collagen and fibronectin, and decreasing the expression of matrix metalloproteinase 1 [39, 40], therefore the blockade of ET-1 signaling has been thought to be a potential therapeutic strategy for fibrotic disorders, including SSc. The first study of the anti-fibrotic effect of bosentan on SSc fibroblasts was reported in 2004 by Shi-Wen et al. A series of studies from their group demonstrated that bosentan suppresses the expression of α-SMA, type I collagen, fibronectin, and CCN2 in SSc lung fibroblasts and ET-1 is a downstream mediator of pro-fibrotic responses to TGF-β in human lung fibroblasts [8, 10, 11]. Following these, Lagares et al. revealed that these previous findings in lung fibroblasts are reproducible in dermal fibroblasts in in vitro experiments and in vivo animal models. Thus, ET-1 and its receptor antagonists have currently drawn much attention in the field of research on the mechanism and treatment of fibrotic disorders, but the detailed molecular mechanism explaining their effects has remained to be clarified. Since ET-1 induces a prominent fibrotic response even in the absence of Smad2/3 activation, which are important intracellular second messengers of TGF-β signaling especially in the regulation of the fibrotic gene program, ET-1 appears to inactivate a potent master repressor acting on a set of fibrosis-related genes. Taking into account that gene silencing of Fli1 results in the induction of COL1A2 gene expression up to the level much greater than that achieved by TGF-β1 stimulation [23, 25, 29, 32, 33, 41], we speculated that Fli1 may be inactivated in response to ET-1 stimulation. Consistent with this idea, a responsive element of COL1A2 promoter to ET-1 was located between −353 and −264 bp, including the Fli1 binding site, and ET-1 activated c-Abl and PKC-δ, resulting in Fli1 inactivation through its phosphorylation at threonine 312. Although other mechanisms may be involved in the pro-fibrotic effect of ET-1, the current data indicate that Fli1 largely contributes to the mechanism explaining the potent pro-fibrotic effect of ET-1 in dermal fibroblasts. Although bosentan attenuates BLM-induced dermal and pulmonary fibrosis in animal models [12, 42–44], its efficacy on skin sclerosis and ILD in SSc, to our best knowledge, has been reported to be limited [20, 21]. In addition to the difference in the pathological process between SSc and animal models, lower potential of bosentan for good tissue distribution, which is estimated around 1% , has been cited as a cause of the unsuccessful outcome of oral bosentan therapy against skin sclerosis and ILD in SSc. Considering that the average peak plasma concentration after a single dose of 125 mg of bosentan, which is a maximal dose clinically used in humans, is 1,584 ng/ml (2.87 μM) in Caucasian and 1,922 ng/ml (3.48 μM) in Japanese subjects , 10 μM of bosentan, which has been used for in vitro experiments with fibroblasts, appears to be much higher than the concentration of bosentan in human skin tissue. In the present study, bosentan suppressed type I collagen expression in a dose-dependent manner up to 40 μM without affecting cell viability in SSc dermal fibroblasts, suggesting that endothelin receptor antagonists with better tissue distribution and tolerability may have potential as disease-modifying drugs targeting skin sclerosis and ILD in SSc by directly inactivating fibroblasts. According to a previous report by Wang et al. , the expression of Fli1 is strongly suppressed at the transcription level by an epigenetic mechanism in SSc dermal fibroblasts. The authors demonstrated that the acetylation levels of histone H3 and H4 are decreased, while the methylation levels of CpG islands are increased, in the promoter region of the FLI1 gene in SSc dermal fibroblasts compared with normal dermal fibroblasts, suggesting that the decrease in FLI1 gene expression contributes to the developmental process of SSc as a potential predisposing factor. The most important observation in the present study was that bosentan reversed the decreased expression of Fli1 protein without affecting its gene expression status in SSc dermal fibroblasts. These results suggest that bosentan can increase Fli1 protein levels regardless of the degree of epigenetic transcriptional suppression in those cells. Given that the reversion of epigenetically repressed disease-related genes by drugs is a general idea for the treatment of various diseases, bosentan may serve as a disease-modifying drug for SSc. Although the efficacy of bosentan on skin sclerosis and ILD is limited, recent papers demonstrated the potential of bosentan as a disease-modifying drug for SSc vasculopathy. In addition to the prevention of new digital ulcers by bosentan [15, 16], Guiducci et al. revealed that one-year treatment with bosentan significantly decreases the number of advanced nailfold capillary changes, such as capillary disorganization, ramified capillaries, and capillary loss, while increasing the number of relatively early changes, including enlarged capillaries, megacapillaries, and hemorrhage, in SSc patients. These clinical findings suggest that the effect of endothelin receptor antagonists on SSc vasculopathy goes beyond the reversal of the potent vasoconstrictive effects of endothelin. This notion has been supported by some experimental data. For example, ET-1 has a potent mitogenic action on fibroblasts and vascular smooth muscle cells [48, 49]. Furthermore, ET-1 prolongs the survival of myofibroblasts by preventing apoptosis . Moreover, ET-1 triggers the pathological inflammation by modulating the expression of cell adhesion molecules on endothelial cells  and by promoting the production of free radical and fibrosis-inducing cytokines, such as monocyte chemoattractant protein-1 and TGF-β, from macrophages . These proliferative, pro-fibrotic, and pro-inflammatory effects of ET-1 contribute to the development of SSc vasculopathy. Considering that endothelial Fli1 deficiency contributes to the development of SSc vasculopathy , bosentan may exert its disease-modifying effect on SSc vasculopathy by increasing endothelial Fli1 expression. The research regarding the effect of bosentan on endothelial Fli1 deficiency is currently underway in our laboratory. Similar to bosentan, our latest paper demonstrated that imatinib reverses the decreased expression of Fli1 in SSc dermal fibroblasts by increasing its protein stability and without affecting its gene expression status , suggesting that imatinib is a potential disease-modifying drug for SSc patients. Consistent with this idea, imatinib moderately improved skin sclerosis of SSc patients in a couple of case reports [53, 54] and case series [55–57]. Although imatinib was poorly tolerated and failed to show a significant effect on skin sclerosis of SSc patients in a couple of clinical trials , previous case reports suggest that some derivatives of imatinib with a better tolerability may be effective for skin sclerosis in a certain subset of SSc patients. Similarly, the clinical response of digital ulcers associated with SSc to bosentan varies from patients to patients [15, 16]. Given that SSc is a multifactorial disease caused by a complex interaction between hereditary factors and environmental influences, these clinical data suggest that imatinib and bosentan may target some disease-associated factors, leading to the modification of the natural disease course in a certain subset of SSc patients. Given that both of c-Abl tyrosine kinase inhibitors and endothelin receptor antagonists target Fli1, a potential predisposing factor of SSc, further studies on the association between the degree of Fli1 suppression and the clinical efficacy of these drugs may provide us some clue to properly select good responders and effectively administer these treatments for SSc patients. In the present study, 200 nM of ET-1 showed the maximal stimulatory effect on type I collagen expression in normal human dermal fibroblasts. However, previous reports demonstrated that 100 nM of ET-1 exhibits a significant stimulatory effect on the expression levels of type I collagen, fibronectin, fibrillin-1, and α-SMA and the gel contraction in murine embryonic fibroblasts and human normal lung and dermal fibroblasts [8, 9, 12, 40, 59]. This discrepancy may be attributable to the different sensitivity of fibroblasts to ET-1 and/or to the different experimental conditions between each study, but the actual reason is unclear. We herein reported the first study regarding the detailed molecular mechanism underlying the pro-fibrotic effect of ET-1 on normal dermal fibroblasts and the anti-fibrotic effect of bosentan on SSc dermal fibroblasts, in which transcription factor Fli1, a potential predisposing factor in SSc, is an important target. Although the efficacy of bosentan for dermal and pulmonary fibrotic conditions associated with SSc is limited, the present observation definitely provides us with a useful clue to further explore the potential of the upcoming new dual endothelin receptor antagonists with better clinical effects as disease-modifying drugs for SSc. We thank Tamami Kaga and Yoshiko Ito for the technical help in immunohistochemistry. This study was supported in part by grants from the Ministry of Health, Labor, and Welfare of Japan, from Japan Intractable Diseases Research Foundation, from Rohto Dermatology Prize, from JSID’s Fellowship Shiseido Award, from the Mochida Memorial Foundation for Medical and Pharmaceutical Research, and from Japan Foundation for Applied Enzymology. The funders had no role in study design, data collection and analysis, decision to publish, or preparation of the manuscript. Y Asano has received honoraria and research funding from Acterion. KA: data collection and analysis, drafting the manuscript and final approval of the manuscript. YA: conception and design, analysis and interpretation of data, manuscript writing, critical revision and final approval of the manuscript. NA: data collection and analysis, drafting the manuscript and final approval of the manuscript. SN: data collection and analysis, drafting the manuscript and final approval of the manuscript. T Taniguchi: data collection and analysis, drafting the manuscript and final approval of the manuscript. T Takahashi: data collection and analysis, drafting the manuscript and final approval of the manuscript. YI: data collection and analysis, drafting the manuscript and final approval of the manuscript. T Toyama: data collection and analysis, drafting the manuscript and final approval of the manuscript. SS: analysis and interpretation of data, critical revision and final approval of the manuscript. All authors read and approved the final manuscript.